Author: Cushman, Thomas Set In . . .
Current debate over the motives, ideological justifications, and outcomes of the war with Iraq have been strident and polarizing. 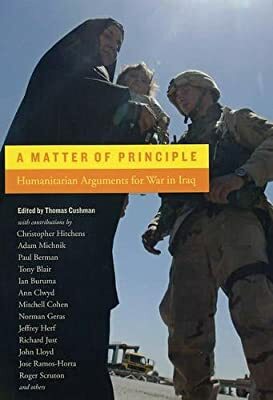 A Matter of Principle is the first volume gathering critical voices from around the world to offer an alternative perspective on the prevailing pro-war and anti-war positions. The contribu-tors—political figures, public intellectuals, scholars, church leaders, and activists—represent the most powerful views of liberal internationalism. Offering alternative positions that challenge the status quo of both the left and the right, these essays claim that, in spite of the inconsistent justifications provided by the United States and its allies and the conflict-ridden process of social reconstruction, the war in Iraq has been morally justifiable on the grounds that Saddam Hussein was a brutal tyrant, a flagrant violator of human rights, a force of global instability and terror, and a threat to world peace. The authors discuss the limitations of the current system of global governance, which tolerates gross violations of human rights and which has failed to prevent genocide in places such as Bosnia and Rwanda. They also underscore the need for reform in international institutions and international law. At the same time, these essays do not necessarily attempt to apologize for the mistakes, errors, and deceptions in the way the Bush administration has handled the war. Disputing the idea that the only true liberal position on the war is to be against it, this volume charts an invaluable third course, a path determined by a strong liberal commitment to human rights, solidarity with the oppressed, and a firm stand against fascism, totalitarianism, and tyranny.